Compound modal verbs express perfect (in the grammatical sense of "completed") actions. These English constructions consist of a modal verb + have + past participle. 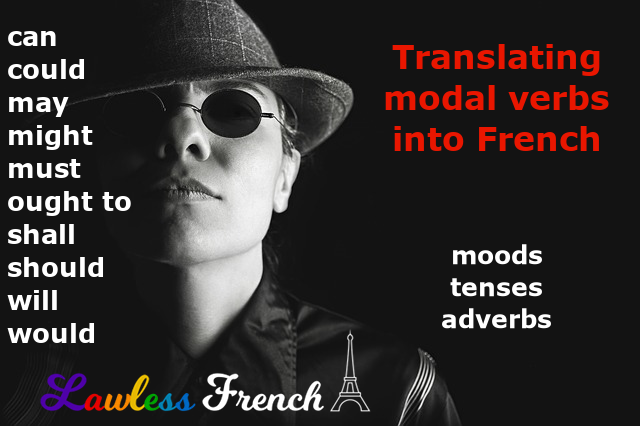 Since modal verbs don’t exist in French, compound modals obviously don’t either; they are usually equivalent to a French verb in a perfect tense or mood plus an infinitive. Could have equals pouvoir in the conditional perfect. He could have been right. Il aurait pu avoir raison. I could have driven there. J’aurais pu y conduire. May have and might have = peut-être with a past tense or il se peut + past subjunctive. I may / might have left too early. Je suis parti trop tôt, peut-être. Il se peut que je sois parti trop tôt. She may / might have been right. Elle avait peut-être raison. Il se peut qu’elle ait eu raison. Must have is equivalent to devoir in the passé composé. He must have forgotten. Il a dû oublier. I must have tripped. J’ai dû trébucher. Shall have and will have plus a past participle are both equivalent to the French future perfect. We shall have overcome! Nous aurons vaincu ! I’ll have left by 2pm. Je serai parti avant 14h. Should have is equivalent to devoir in the conditional perfect. You should have studied more. Tu aurais dû étudier plus. We should have tried again. Nous aurions dû essayer encore une fois. Would have equals the French conditional perfect. I would have liked to see it. J’aurais aimé le voir. You would have gotten sick. Tu serais tombé malade. Previous Quoi de neuf ? I just completed reading the lesson on modal verbs, but i do not understand why the following sentence is correct. I say this because I thought passer used être as an auxiliary verb in the past tense. Good question! You’re right that if the verb in the compound tense is partir, you need être as the auxiliary, as in Ils seraient partis plus tôt – They would have left earlier. However, in this example partir is in the infinitive, not a compound tense. The main verb in the compound tense is devoir, which requires avoir as the auxiliary. I hope this helps – bonne continuation !